Once you’ve installed Syncany, you can either use the Syncany graphical user interface (GUI), or the command line client (CLI). While the GUI is probably easier to use, the CLI offers more functionality and flexibility. After installing Syncany, open it from your apps menu and if all goes well, you’ll see a tray icon with the Syncany symbol in your notification area. To use the plugin, a restart of Syncany is necessary. Once you’ve gone through all of these steps, you can start adding your files to the local sync folder and connect other devices to your repository. Syncany will run as a daemon in the background and watch for changed/added/deleted files. To see a screencast of the whole process, check out this YouTube video. Also check out our other Videos. 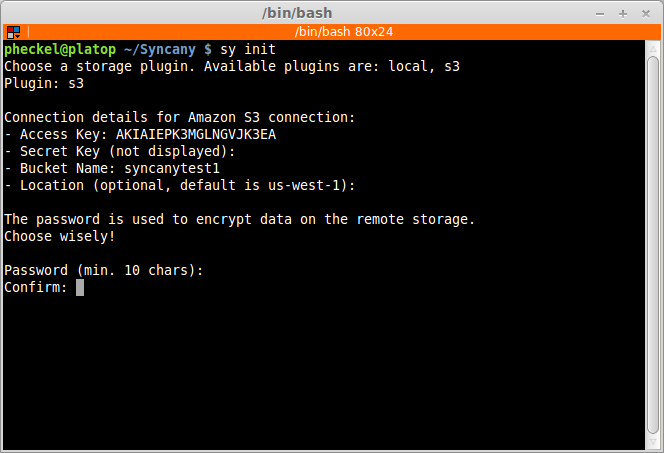 Once the plugin is installed (in this example the Amazon S3 plugin), you can set up a new repository: To do that, simply navigate to the folder you want to synchronize and type sy init command. An interactive command line interface will ask you a couple of questions about how to connect to the offsite storage (hostname, credentials, etc. ), and it will ask you for a password to encrypt your data with. As soon as you’ve successfully run the init command, the repository is all set up. 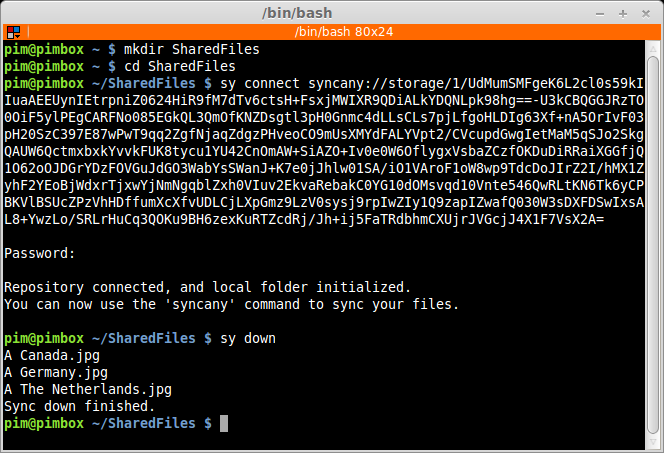 You can now sync files to it using sy up and sy down, and you can connect other client with the sy connect command. The command will output a link that you can share with trusted friends or colleagues that enables them to connect to the same repository. Syncany will synchronize everything in the initialized folder (including sub-folders). If you are just starting out, choose a small directory and and get a feel for the tool before synchronizing large amounts of data. Do not sync your home directory! Syncing files manually is useful for automated backup jobs, or if you want to use Syncany like a version control system. Using the automatic syncing turns Syncany into a Dropbox-like tool, because changes on local files are detected automatically and remote changes are synced right after they happen. Unlike a version control system, however, there is no need to first add, then commit and then push changes – the sy up command combines these actions into one. 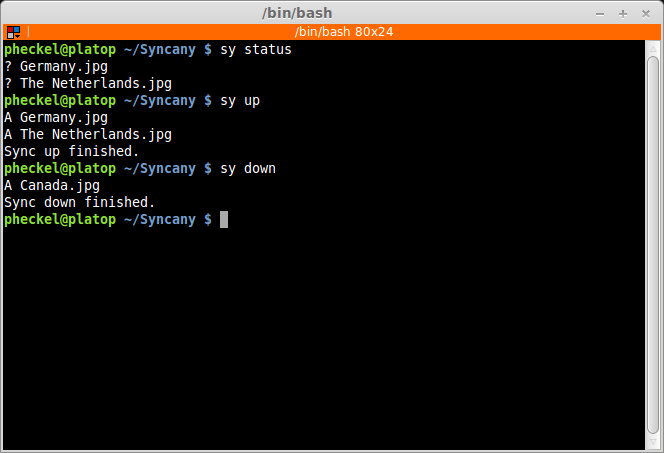 Similarly, the sy down command fetches and applies changes in a single command. There are a couple of other very useful commands to manage a repository and a local Syncany folder: Use sy ls to show the current and past file tree, sy restore to restore old or deleted files, and sy cleanup to save space on the offsite storage by removing old file versions. A full list of commands can be found in Commands. As of today, the automatic synchronizaton setup is not as easy as it should be. We are aware of that and are working on a solution. 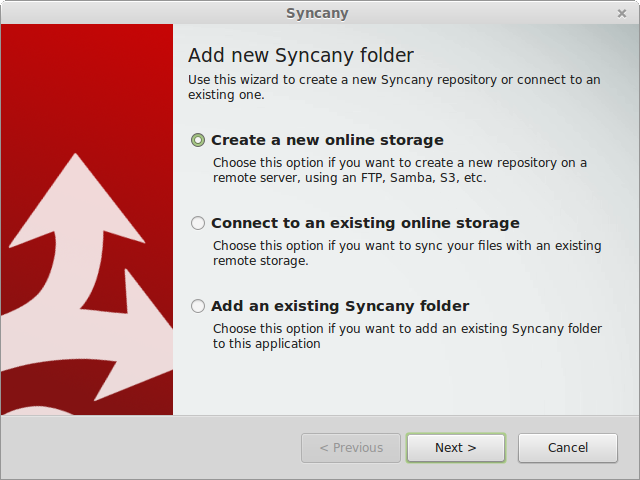 To set up a Dropbox-like folder synchronizaton for a Syncany folder, the folder has to be managed by the Syncany background process (also called the daemon). This background process can be started with sy daemon start. Once the daemon is started, all registered folders are monitored for changes and remote changes are automatically applied to the local folder. All of these actions happen in the background – without the need for any intervention. By default, calling sy init or sy connect will not add the added local folder to the Syncany daemon configuration. That means, that unless you call the command with the --add-daemon option, the folder will not be daemon-managed. If you want to use the daemon, use sy connect --add-daemon or sy init --add-daemon. 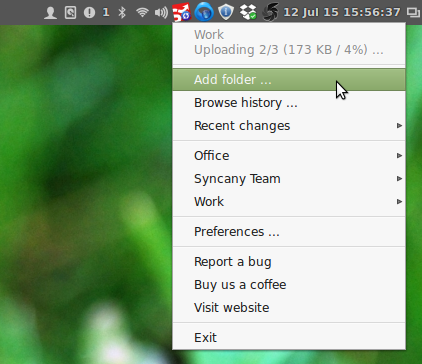 To let the daemon know about the new folder, run sy daemon restart (or sy daemon reload, only on Linux). Both methods work equally well, but the syncany://-link method is more convenient. A syncany:// link contains the exact same information that was initially queried by the interactive sy init command – namely the plugin-specific settings such as hostname, user/password, and so on. Clients that already have access to the repository can create such a link by calling sy genlink form within the Syncany folder. Once a new client is connected to a repository, all of the above mentioned commands can be used to either manually or automatically sync the repository. While the syncany://-link itself is encrypted and may be shared via unsecure channels, sharing the link and the repository password gives users read/write access to your repository and typically enables them to access the entire backend storage. Remember: Do not share the syncany:// link and the password with users that you do not fully trust. Users in possession of the link and the password might be able to delete/change files on the backend storage! If, for instance, the repository is based on an FTP folder, the syncany:// link contains the FTP username and password. Users with access to the Syncany repository can also access the FTP storage with a regular FTP client and delete/change files as they wish.